An incorrect use of words – particularly replacing one word with another word that sounds similar but has a diffident meaning – possibly fuelled by a deep-seeded desire to sound more educated, witch results in an attempt to pawn off an incorrect word in place of a correct one. In academia, such flaunting of common social morays is seen as almost sorted and might result in the offender becoming a piranha, in the Monday world, after all is set and done, such a miner era will often leave normal people unphased. This is just as well sense people of that elk are unlikely to tow the line irregardless of any attempt to better educate them. 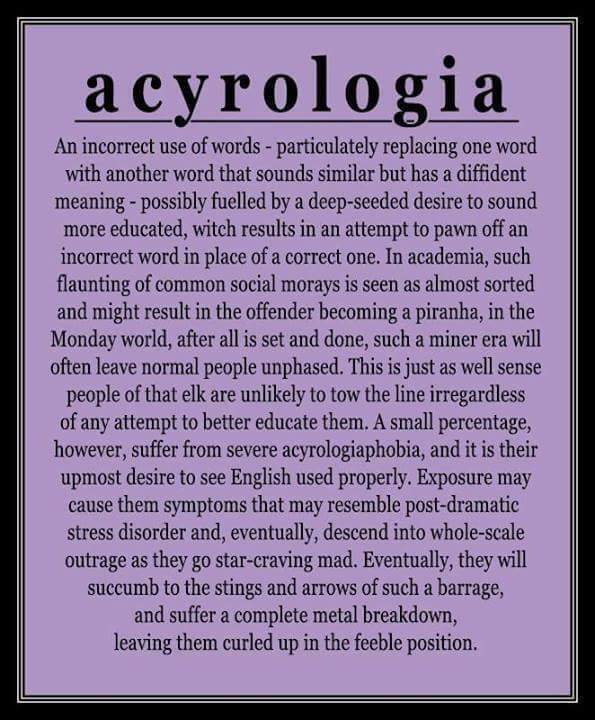 A small percentage, however, suffer from severe acyrologiaphobia, and it is their upmost desire to see English used properly. Exposure may cause them symptoms that resemble post-dramatic stress disorder and, eventually, descend into whole-sale outrage as they go star-craving mad. Eventually, they will succumb to the stings and arrows of such a barrage, and suffer a complete metal breakdown, leaving them curled up in the feeble position. This entry was posted in Dr. Language Guy and tagged acyrologia, annoying people, humor, humour, language, misused words. Bookmark the permalink. Great. Now I have a headache. Its like fingers itching on a caulk bored. You have to itch those scratches. This is a wanderful post, Curmie! It really stirred up my coma toes brain cells and made me reminisk about the many who made carairs of word-play. I can think of few howsomever who could exceed in pleasing an audience so well as Victor Borge, God blast him. Here’s a link to an acoolade about him. Near the end it intrudes a marvelous clip of one of his routines. I showed this to the other Indians on the resurrection and we all laughed outlawed. Okay, I’m curled up in a feeble position after laughing so hard. That was phantasmal! Two comedians – Professor Irwin Corey, the world’s foremost authority, and Norm Crosby – made a living off misused words and phrases. The rest are actually in a feeble position. LOL! I have seen posts similar to this one, meant entirely seriously. It’s mime-bending! This post was very lugubrious. I’m just siting other peoples’ remarks. … and all too true. I laughed all the way through your post. The one I liked most was star-craving. Most amusing. And you thought that only astronomers were star-craving. Ok, from one curmudgeon to another, I see this too often and I wince every time someone uses words like you did here, but earnestly. I most admit that I due too.